With a week and a half to go, the sewing machines are whiring away here at Stafford Mill, in preparation for the Textile Trail Open Studios, taking place on the weekends of the 12 & 13th and 19th & 20th of May. Hand woven silk scarves by Leo & Ariadne. Fascinators, brooches, corsages and Obi style belts made from recycled ties, by Sanguinello. 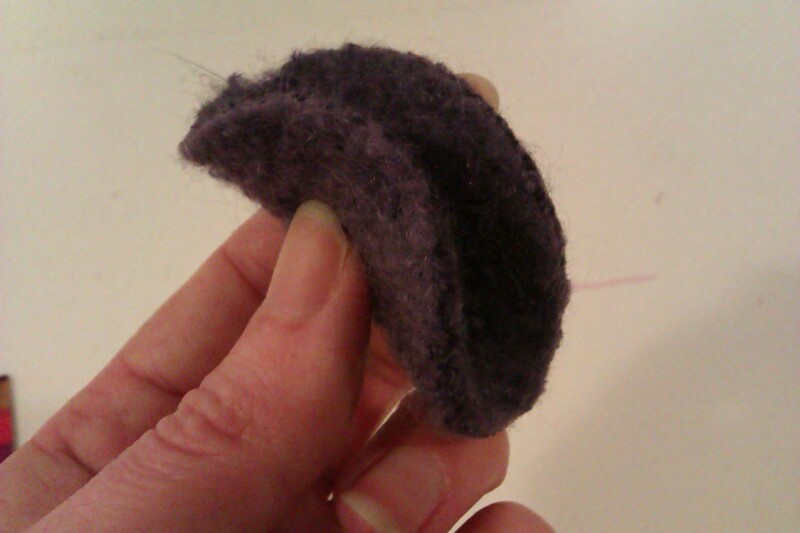 I have been busy snipping and sewing with scraps of felted wool to make a new range of flower head bands, based on my current favourite felt flower design! It’s a great way to use up small off cuts, and I’ve discovered a use for old, felted, moth damaged woollen scarves, which come in a variety of bright colours, perfect for making flowers. They work particularly well combined with feathers, and all fixed on a pretty elastic fabric band. I’ve also been making more fascinators with old Monopoly sets, and came across another game called Totopoly, which works on a similar theme but is based on the world of horse racing! Perfect for anyone looking for a unique head piece to wear to Cheltenham Races! One of my aims for this year was to find more shops and outlets to sell my work through. As a small scale maker it can be intimidating approaching new retailers, and it’s hard not to take each knock back personally. The best leads often come from word of mouth, through friends and family. A casual conversation can lead to an opening, an opportunity to introduce your work, and yourself as a maker. There’s lots of factors to consider, not just whether they ‘like’ your products, but how will they be presented and displayed, what are your trade and recommended retail prices, how do they sit with the rest of the stock already in the shop? However, when you hit on the right place , and find yourself falling in love with the products they already stock, you know you’re on the right track! 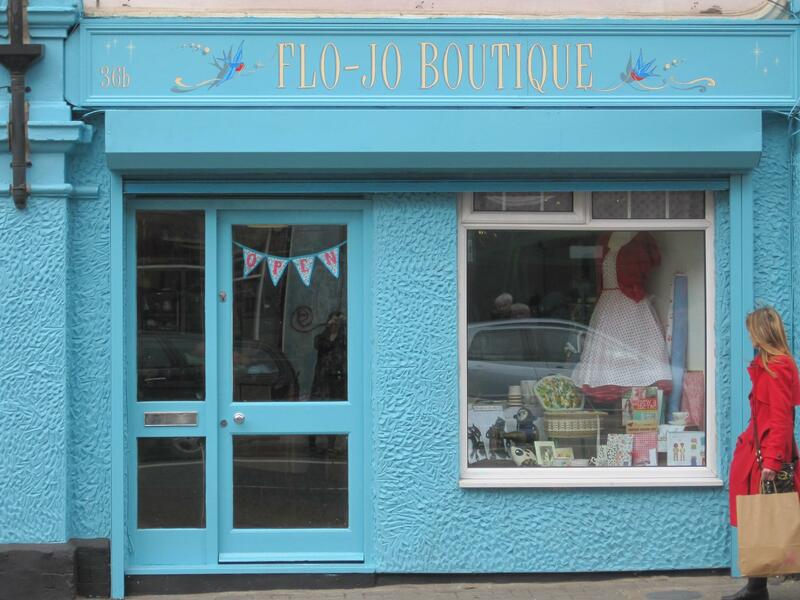 Flo-jo Boutique is a new shop in Bristol, on the Gloucester Road, a vibrant area which boasts of being one of the few remaining independent High Streets, with a rich variety of locally run shops, cafes, bars and restaurants. Although the shop is a new venture, it’s founders, Delia Dee and Erika, are two very talented ladies who have been working together for years. 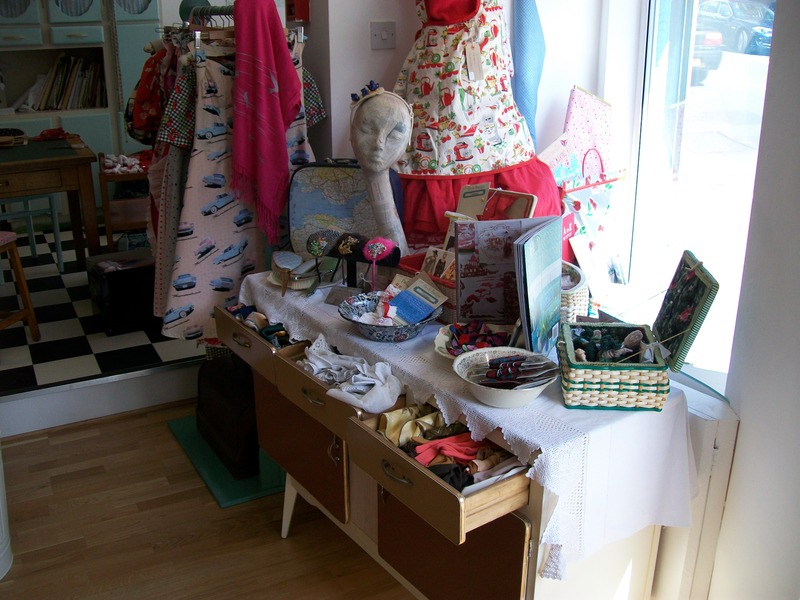 They make vintage and retro style clothes, pinnies and aprons, and underwear! They have created quite a stir with their Fancy Pants Knicker Making Kits, and also run sewing workshops where you can make your own pair of saucy undies. I am very excited to have the opportunity to sell my work here. After spending a weekend working away in my studio I have sent them a range of my Fascinators, mainly the feather and vintage jewellery ones, and little Felt Flower Corsages, all of which have gone straight out on display! 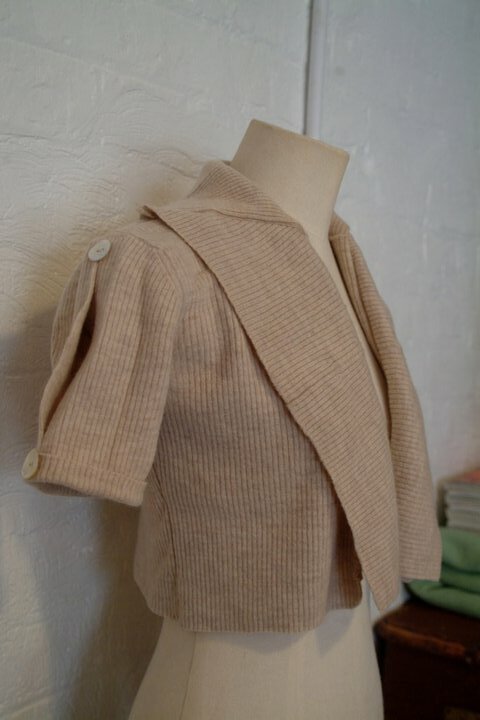 The idea for these little bolero style cardigans came about when I needed a cover-up to go over the lovely vintage dress I wore to my sisters wedding. It was in May, and the unpredicatable English weather could go either way…so I needed something that would keep me warm if it was cold, but wouldn’t swamp me or hide the dress….I was searching for a pale coloured stole or bolero, to no avail. 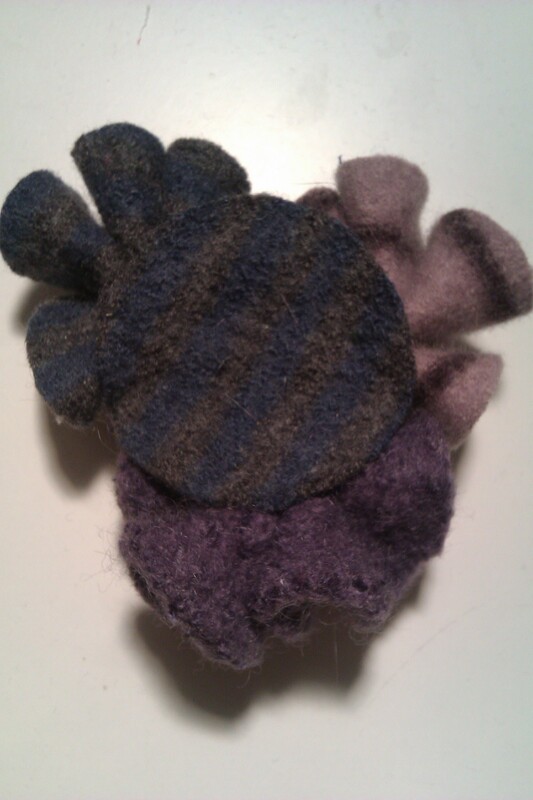 With just over a week to go a friend advised me to make something from an old, felted wool jumper – readily available from a charity shop or carboot fair near you! She explained how easy the felted wool is to cut up and manipulate, you don’t have to hem it, and it keeps you warm whilst still letting the skin breathe. I duly went out that weekend and found a suitable jumper, cut it open up the front, shortened it, cut the sleeves down, added an extra piece at the shoulder to make puff sleeves, et voila! It was a bit rough around the edges, but did the job, and attracted a lot of compliments! This led me make a small range of them to sell, I played around with the design and added a collar, using the hem I’d cut off the bottom of the jumper, and adding ruching here and there to give vintage details. Now spring is in the air again I’m updating the range and they will be available on the Handmaids stall at Stroud Farmers Market, or I can make them to order if you want a particular size or colour. 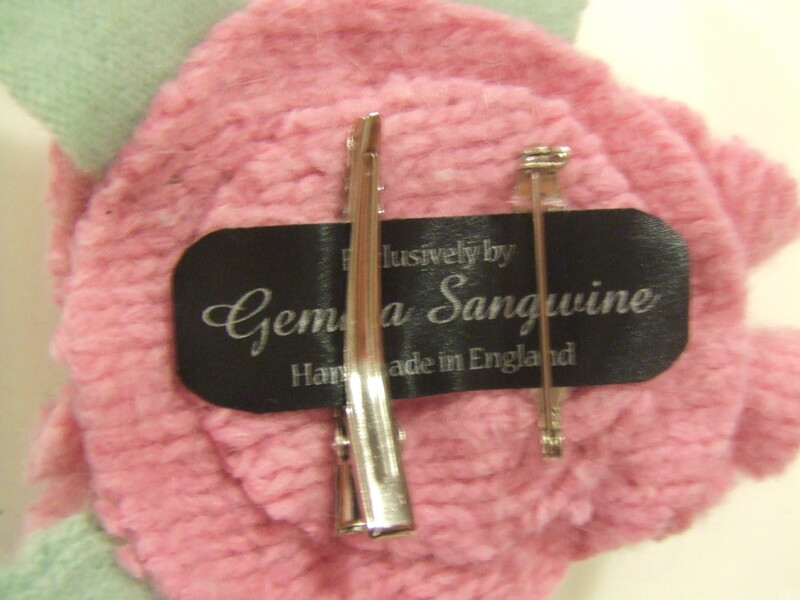 The ones made from cashmere are especially luxurious! 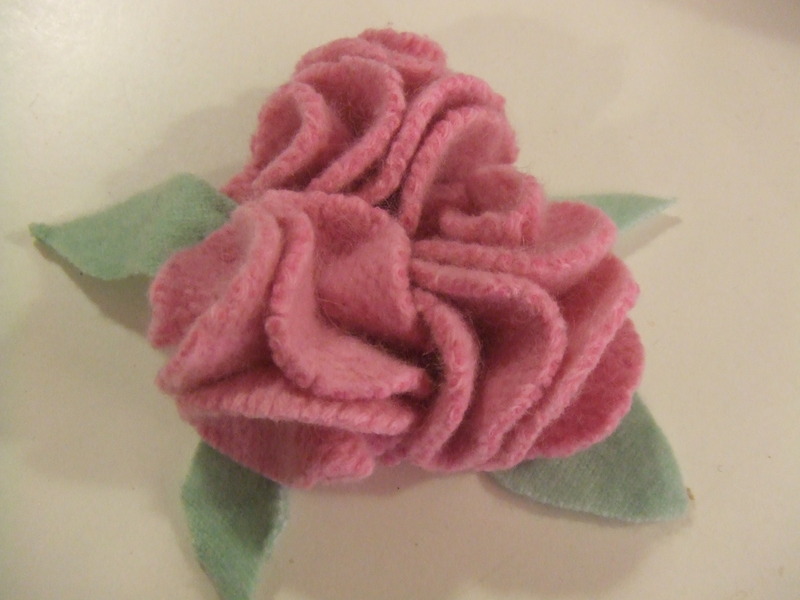 So here’s a brief run down on how to make these felt flowers. 1. Start with a circular template, in this case I’ve used the lid to an aerosol can, approx 5cm across, but use anything similar that’s to hand or cut a cardboard template to suit. 2. Draw out 3 circles, taking care to make the best use of the fabric available. 3. Carefully cut them out, cutting inside the line or, as I’ve found from experience of using black marker pen, you get an unsightly black line around the edge of the flower! 4. Take one of the circles and, with the right side of the fabric facing out, fold it it half. 5. Then fold it in half again. Now, repeat steps 4, 5 & 6 with the other two fabric circles. You’ve now got 3 fabric flowers! 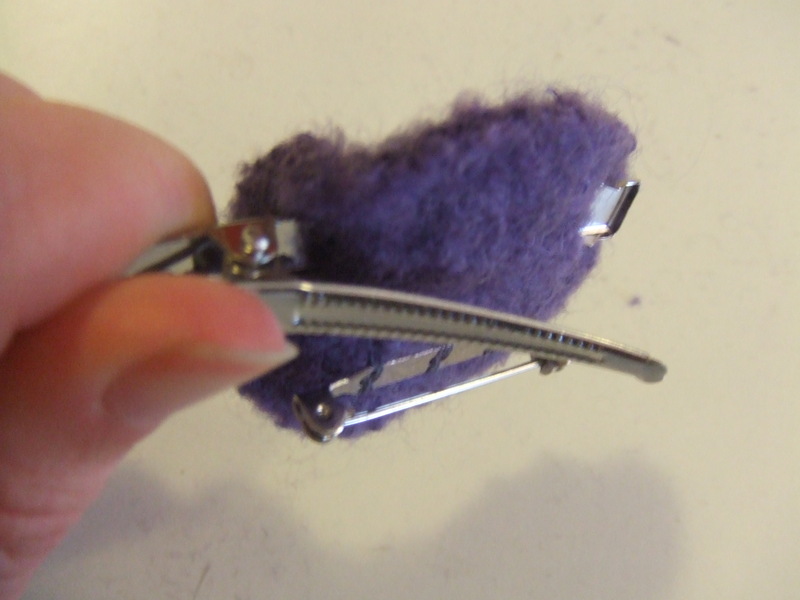 To make even more impact, sew the 3 together to make a corsage. 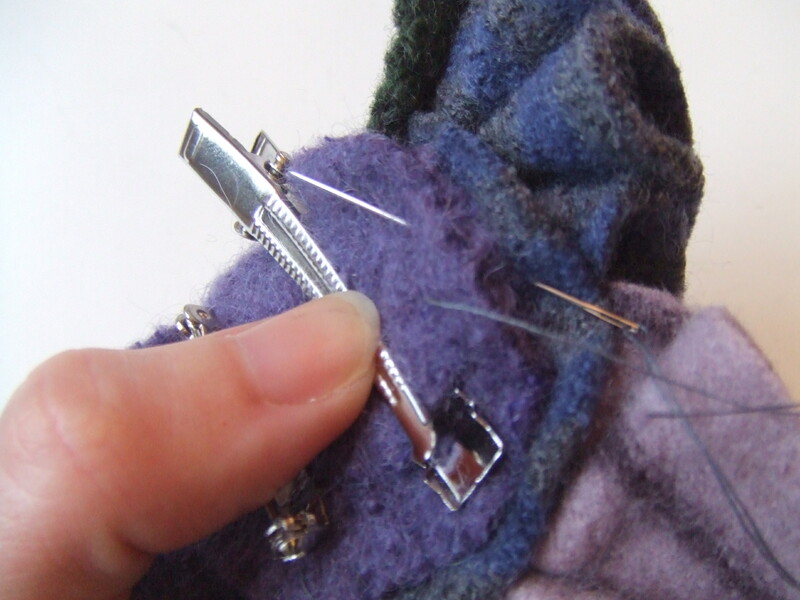 Group them together and sew through the bases. With the felt flowers groups of 3 work well. You can also make them from lighter cotton or silk, in which case you can group more of them together as they are not so bulky. 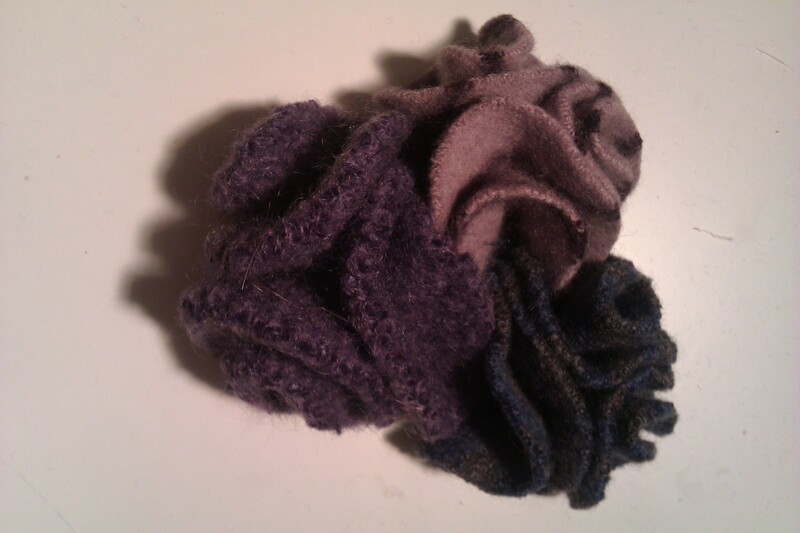 In this case I’ve made 2 more corsages from tonally matching felt and grouped the 3 together to make a super corsage! Cut out another 2 circles, to use as the back, and sew the 3 corsages onto one. 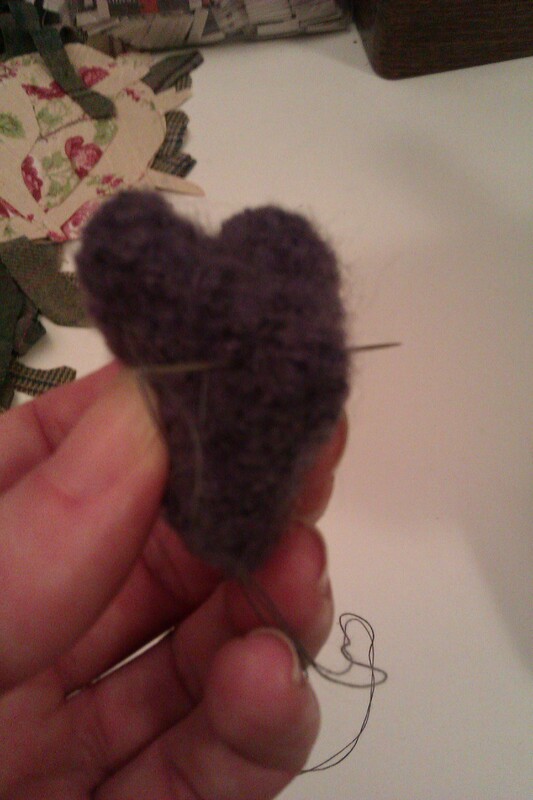 And sew a brooch back onto the other. You can add a crocodile hair clip too, in this case I’ve made 2 slits in the fabric and pushed the back of the clip through the slits. 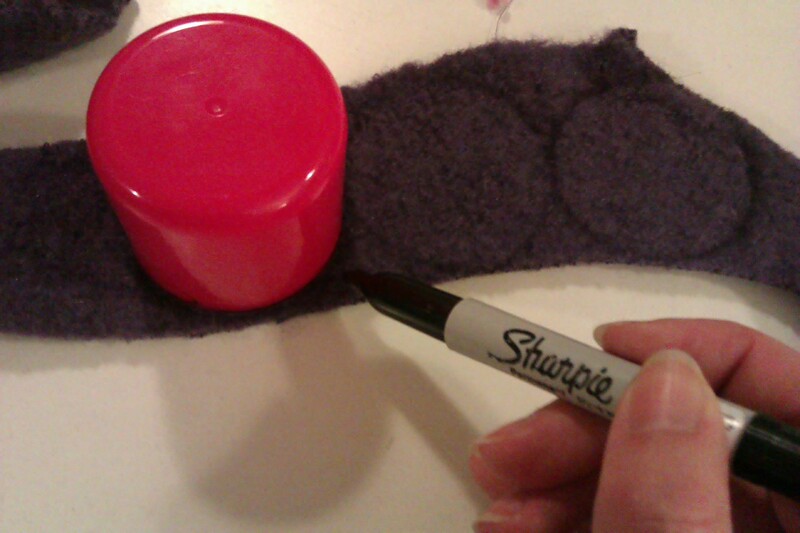 You can also add leaves by cutting oval shapes out of green felt and sewing them onto the back too. 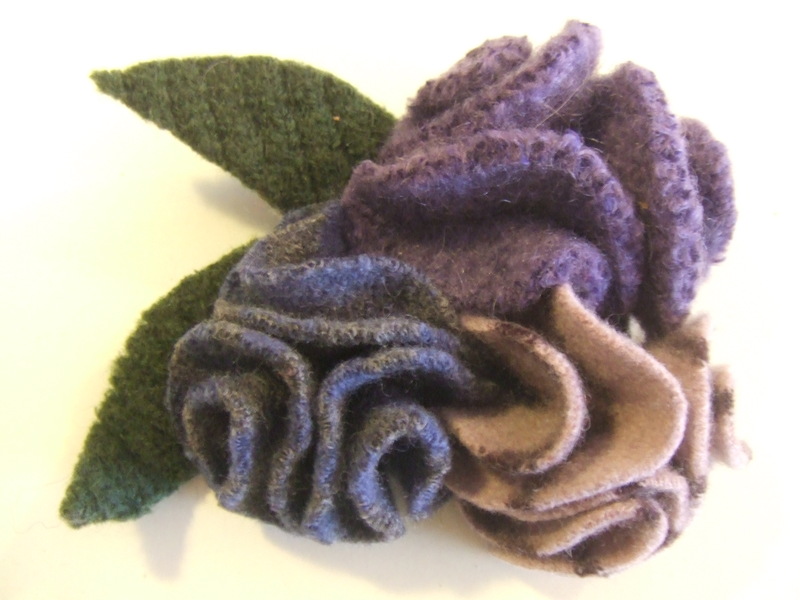 These corsages are perfect for using every scrap of fabric left over from the felted wool jumpers! 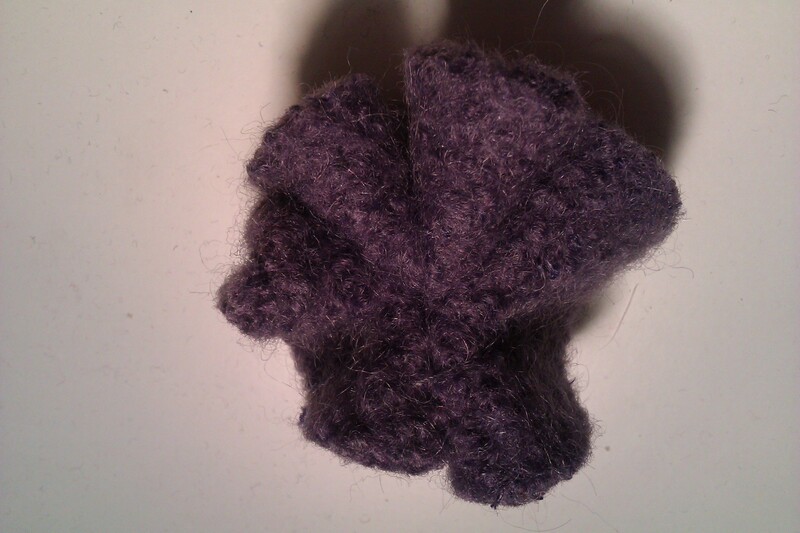 This lovely pink wool and angora flower came from a jumper which had already yielded enough fabric to make a pair of slippers and a pair of wrist warmers. They are fairly easy to make. 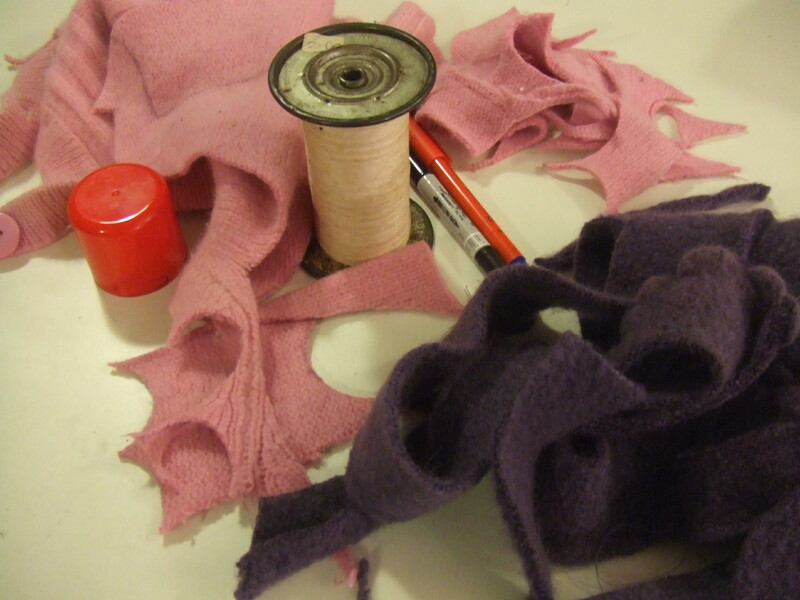 You cut circles out of the fabric, fold then over twice and tack together. I will go into more detail later; the dark purple fabric is up for flower making next so I will photograph it as I go along. 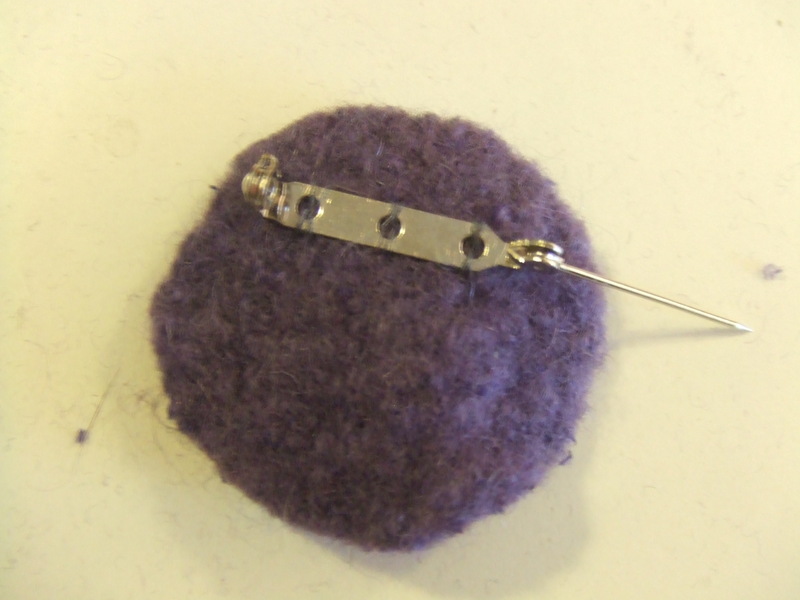 I add a brooch back and a hair clip, to make them easy to wear. Had a great day at Prema Arts Centre yesterday, running an afternoon workshop. 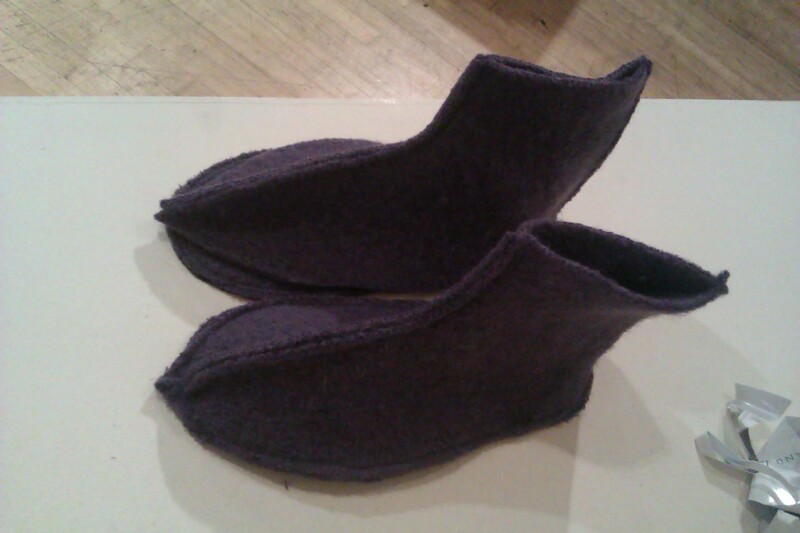 We were making a pair of slippers out of old, felted woolen jumpers. The emphasis was on using favourite jumpers which had been a victim of the washing machine and shrunk to unwerable proportions! We followed a simple pattern, adapted from ‘Sewing Green: 25 Projects Made with Repurposed and Organic Materials’ by Bez White. The pieces were cut out and stitched together right-side out so you get a thick, decorative seam around the edges. The soles were re-inforced with leather heel and toe grips. 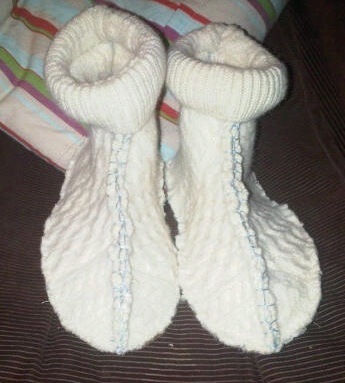 Pictured above are Jenny’s slippers, almost finished! 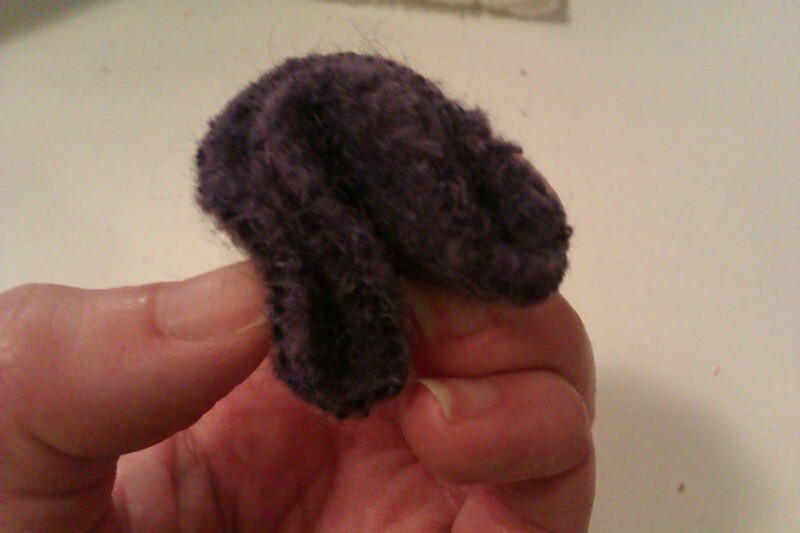 The jumper was a hand knit and had shrunk to make a lovely, thick felt. 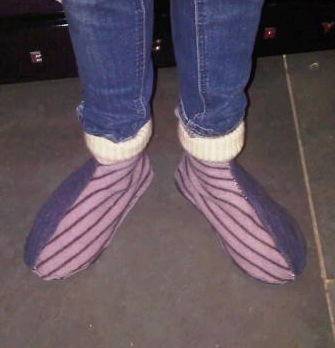 Here are Emily’s slippers, great use of mixed materials. 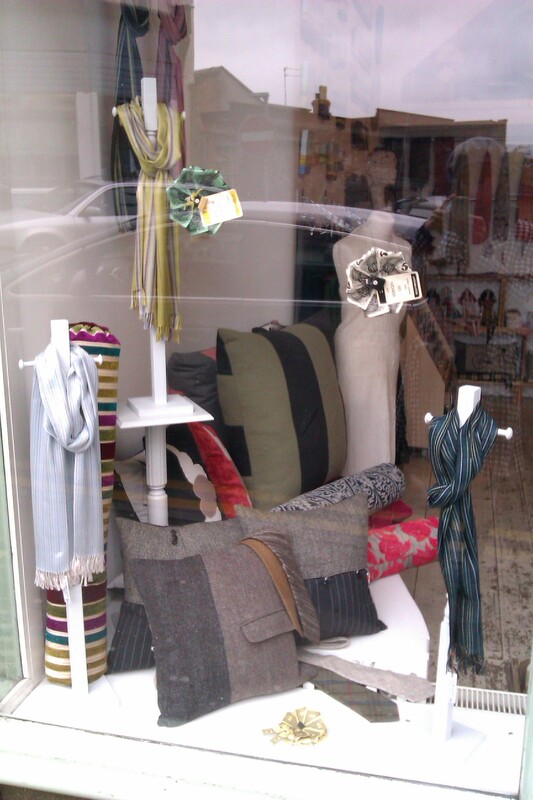 The stripey fabric was from two jumpers which were accidentally felted. The cuffs are from an old Aran jumper (see below!). And Ruth’s, which look particularly cosy – made from a chunky Aran jumper and finished with blue blanket stitching. 2012 – a new year of prophesies and resolutions! One of my resolutions is to sort out a website for my work, so here we go! I hope to use this blog to showcase new products as they are made, and to link in with my facebook and etsy pages. 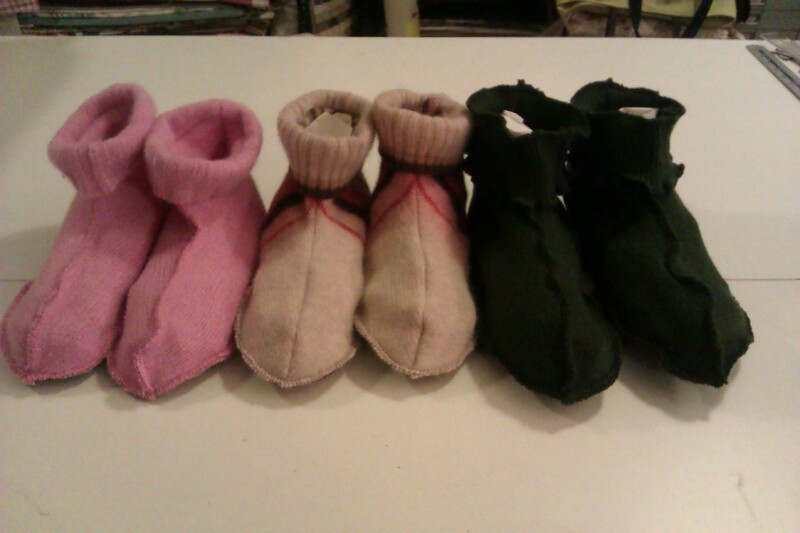 2012 should be a busy year, I am running an afternoon workshop in a couple of weeks on making slippers, mittens and wrist warmers from recycled felted jumpers, and am booked to take part in the Stroud International Textiles Open Studio event in May. 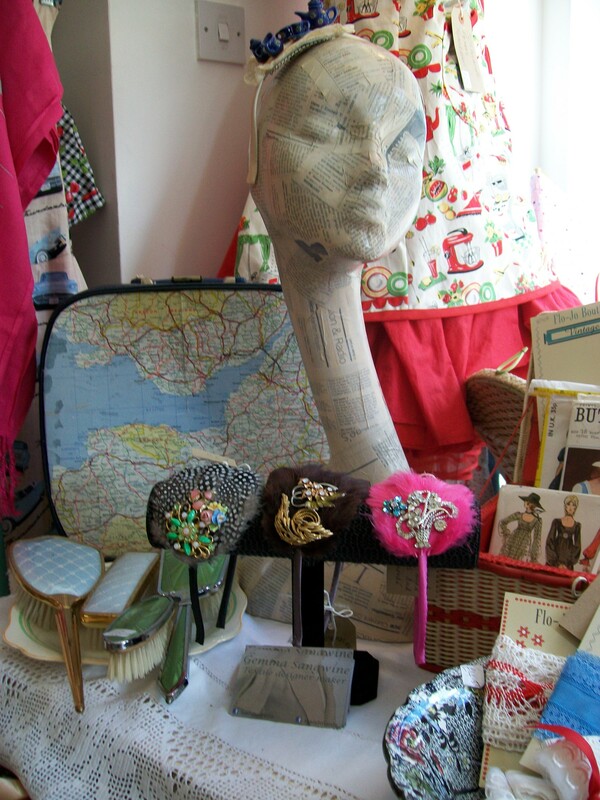 You can see and buy my work through Made in Stroud and at the Stroud Farmers Market on the Handmaids stall. Another resolution is to find more shops and stockists! Any advice and suggestions greatly received….